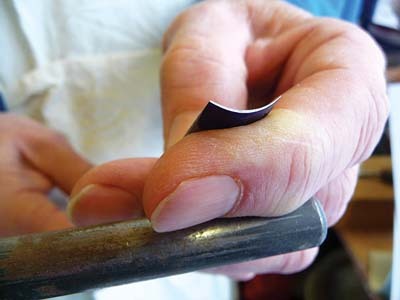 Sharpening gouges is a crucial skill for all woodcarvers to have under their belt - the quality and ease of work relies heavily on keeping tools sharp. To some, it may seem like a daunting process but once mastered, you will be able to sharpen and maintain the edge on your tools, producing quicker and better carvings. Of the five stages, not every one of them has to be repeated when sharpening a tool. Assess each time which stage is needed to bring the edge back to sharpness. If the edge is chipped, then regrinding will be required, but if the chisel is cutting well then perhaps just strop it to maintain its edge. 1 There may be either one or two bevels on a gouge, but the important thing is that the bevels are flat longitudinally from the edge to the heel. 2 The angle, or included angle if there are two bevels, should not be more than about 20 degrees, however, if chisels are being used with a mallet on very hard timbers, then the angle may need to be modified to 22 degrees or 25 degrees. 3 The shape of the cutting edge should be straight, curved or angled, but the shape should be intentional rather than as a result of bad sharpening technique. 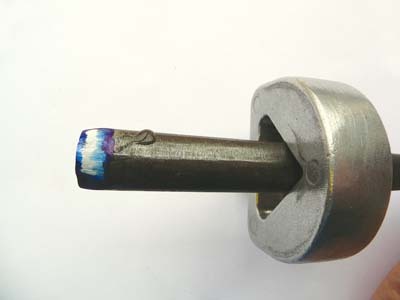 Use a permanent marker pen to cover the bevel with ink (see gallery image 2). 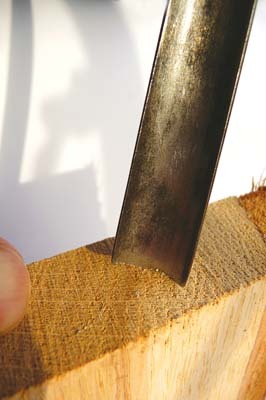 During sharpening, the ink will be rubbed off the bevel, indicating whether or not all the bevel is being honed and thus producing a sharp edge. It is essential that from the beginning, the three rules of sharpening be maintained. When you first start to sharpen, it is difficult to see which part you have just ground or honed etc, and this is where the marker helps. Grinding is a process whereby relatively large amounts of steel are removed from the bevel and/or the edge of a tool. Because grinding causes a lot of friction and heat, generally the process is carried out using a water-cooled whetstone to avoid damaging the temper of the tool. 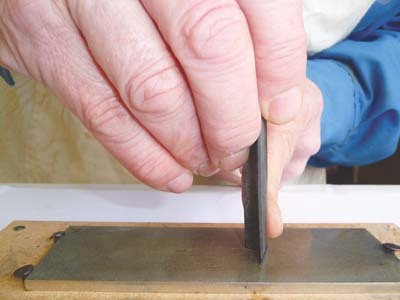 Choose a tool for sharpening, preferably a 1/2in or 5/8in No.4 or No.5 sweep - leave the deeper gouges until your technique is more established. 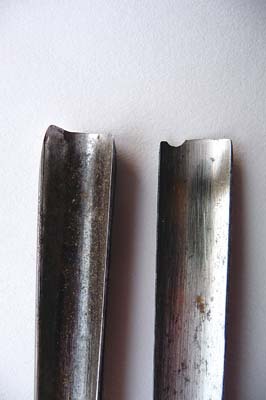 Chips in the chisel edge mean regrinding, and the first stage is to grind the edge back past the damage (see gallery image 3). it against the round jig bar and with gentle pressure, the tool is moved from side to side, covering the whole width of the revolving stone (see gallery image 4). During any stage of grinding, it is important to make use of the full width of the stone. If not, the stone will wear unevenly, making it much harder to get a straight edge on the tool, and also the stone will need truing up, which all takes time and wears away the stone surprisingly quickly. Once the edge has been ground back so all chips are removed, there will be a clear facet of steel showing on the chisel edge (see gallery image 5). 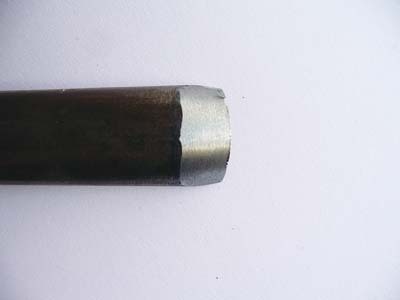 This gouge is held in a carving tool grinding jig, designed to hold many different shapes of gouges (see gallery image 6). Before doing any serious grinding, check the angle of the bevel, put marker ink on the bevel and set the tool in the grinding jig. After a couple of seconds grinding, double check that the angle of the bevel is correct using your bevel gauge (see gallery image 7). - it may be that the tool is too far back in the jig, or it may be that the jig bar is too high or low. Ink up the bevel and try again. The object of grinding the tool is to create a flat or hollow bevel at an angle of about 17 degrees that is an even band across the chisel width. Generally, the edge will be square across. Roll the tool from side to side, in line with the grinding wheel to maintain squareness of the edge. Use all the width of the stone to avoid wearing it unevenly (see gallery image 8). Grindstones cut surprisingly quickly - keep checking that the bevel is being ground correctly. Sometimes chisels are slightly uneven in thickness and this means that grinding the bevel is not about just rolling the bevel on the grindstone, but looking at the edge every two or three passes to ensure that an even thickness of edge is being created. This may mean that some parts of the bevel will need more metal removed than others. As the edge gets thinner, it is very easy to over-grind. I prefer to stop grinding before the â€˜wire edgeâ€™ stage - the point where the metal is worn so paper-thin, that it bends away from the grinding stone. 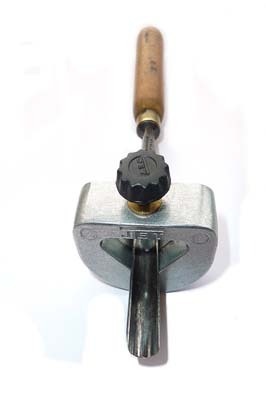 Ideally, the bevel should be a single, slightly concave plane of an even width, following the curvature of the back of the tool (see gallery image 9). At this point, it is very difficult to see what is happening, so I watch the edge until it is about as thick as a human hair. 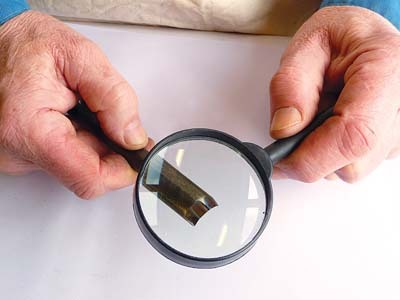 A magnifying lens is useful to help see what is happening to the edge (see gallery image10). The bevel should look even across the back of the chisel. If you do not have access to a grindstone, you could use a very coarse bench stone, although it will take longer. A medium grade bench stone is appropriate for this stage of honing. The honing stone (see gallery image 11) is a metal plate covered with diamonds, which can be fine (600 grit), or very fine (1200 grit). There are many honing systems available for chisel sharpening and all have their merits. The diamond systems have the advantage of remaining flat throughout their life, whereas many other types of stone become hollow with use and need flattening. Lubrication during honing can be by oil, water or using one of the available cutting fluids. These are excellent for diamond systems and reduce clogging of the honing plate - plus the tool steel is less likely to rust. In order to produce a flat, even bevel, the gouge is rolled from side to side as it is rubbed along the stone, starting on one side of the edge (see gallery image 12) and by the time the gouge has reached the other end of the stone (see gallery image13), the opposite side bevel should just be in contact. 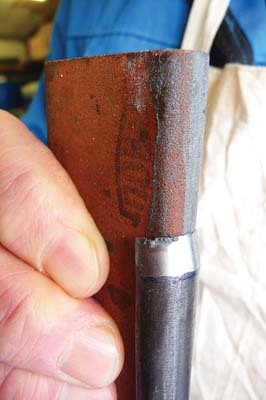 When sharpening gouges, it is important that the shaft of the tool is kept at a constant 90Â° to the stone during honing. Continue honing until the wire edge stage. It is very important to maintain a constant height with the handle in order to keep the bevel even (see gallery image14) - the other hand that normally steadies the tool has been left out of this photo for the sake of clarity. 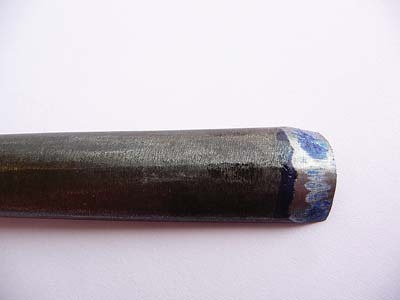 On a hollow ground bevel, the marker ink will be removed from the edge and heel of the bevel at the same time (see gallery image 15). At first, it is quite likely that your technique may need some fine-tuning, so donâ€™t worry! of marker across the bevel. Sometimes when grinding or honing, the edge of the gouge becomes a little wavy and needs to be â€˜trued upâ€™ by gently drawing the tool edge along the stone at right angles (see gallery image 16). This will produce some places on the edge that have small flat areas, which can be removed by careful, localised honing. 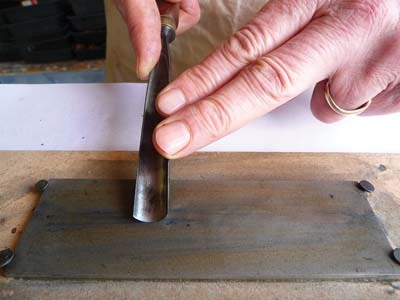 Continue honing, looking at the bevel every five strokes or so, re-inking if necessary, until the bevel is flat and evenly honed, and eventually the â€˜wire edgeâ€™ develops (see gallery image17). To remove the wire edge, it is necessary to hone the in-cannel or concave face of the gouge. 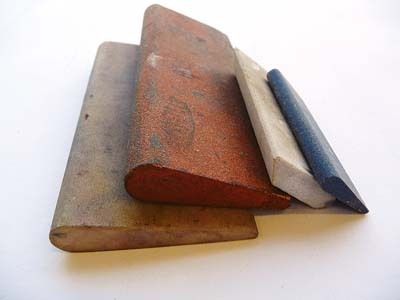 A range of slip stones of different levels of coarseness is available, shaped with convex faces of various radii, that will fit the many concave in-cannel shapes of gouges (see gallery image 18). Use a middle range India slip stone to remove the wire edge. Lubricate it by first touching the honing face onto the lubricated bench stone to pick up some oil or water. Ink up the end of the inside face of the gouge. Position the tool with the handle supported on a block so that it is easy to see what is going on at the cutting edge. Place the slip stone so that the corner furthest from the cutting edge contacts the in-cannel (see gallery image 19). Next, gently bring the slip stone to the position where it is laying flush against the hollow inside face of the chisel (see photo 20). We want to hone off the wire edge by gently rubbing the slip stone up and down, making sure that the slip stone is as flush as possible in the hollow of the gouge, and that all the inside face of the edge is honed. In most cases, this will give a very low angle bevel of about 1 or 2 degrees. of the in-cannel of the gouge, which will alter the angle of the included bevels i.e. the combined angle of both the main and inner bevel - the true angle becomes well over the desirable 20 degrees. The top gouge in gallery image 21 has a clear inside bevel. 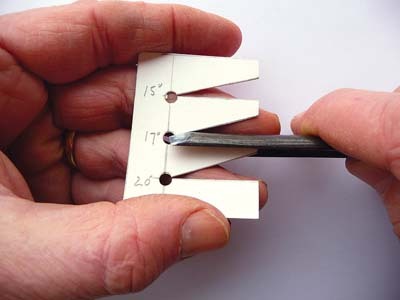 If two bevels are required, and this is usually for shallow sweeps used for gouge cut finishes, then the inside bevel can be honed at about 5 degrees, however, donâ€™t forget about the overall angle - make an allowance for this at the grinding or stage 1 honing. 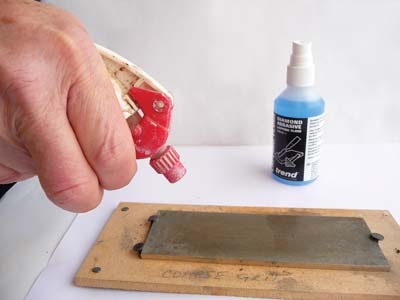 After using the slip stone, success will be indicated by the marker ink being evenly rubbed off and the wire edge becoming detached (see gallery image 22). Check with your magnifying lens and hone locally any areas that have been missed. If the wire edge is reluctant to release, gently rub the edge across a piece of scrap wood to help it break off (see gallery image 23). 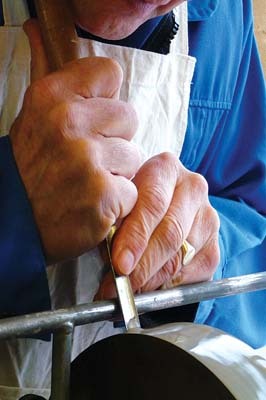 The second stage of honing is designed to begin the polishing stages. 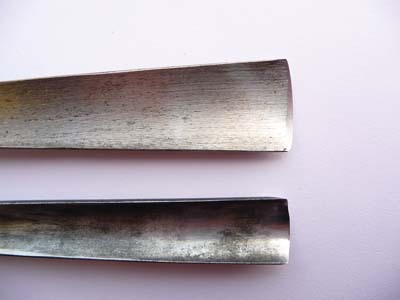 To obtain a razor sharp edge, it is necessary to polish away the coarse abrasive marks caused by the first stage of honing. 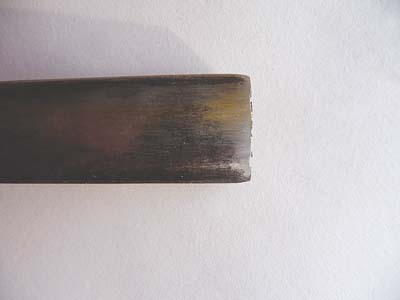 Ink up the bevel and using a fine stone (1200 grit), hone the outer bevel using the same techniques that were used in Honing Stage 1 (see gallery image 24). Keep the bevel flat, checking every five passes that the ink is being removed in the correct way. Ink up again if necessary. Gradually, a fine wire edge will appear. Ink the inside of the gouge and using a fine slip stone as before, gently hone the inside bevel until the wire edge breaks off. 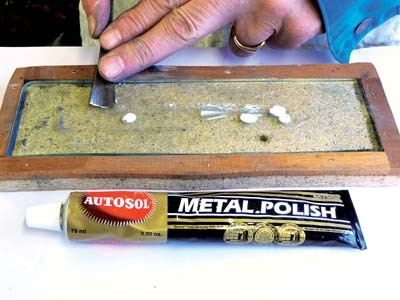 Final polishing can be achieved with Arkansas stones using the same techniques as with the previous honing, but I prefer to use a slab of 4mm float glass, about the same size as a bench stone, with Solvol metal polish working as a gentle abrasive. 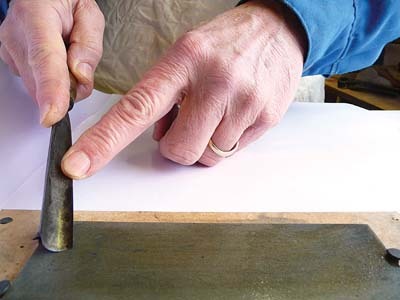 This method polishes the bevel to a mirror finish and gives a razor edge. Dab a few small spots of the metal polish on the glass plate. 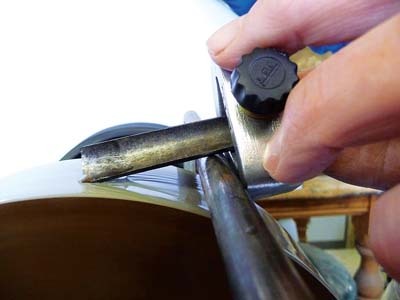 Ink up the bevel and using your honing techniques, hone/polish the bevel to a mirror finish (see gallery image 25). To polish the inside bevel, use a sander to make up some â€˜slip stonesâ€™ of various radii from scrap MDF. 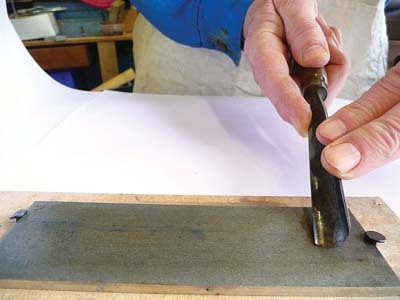 Ink up the in-cannel of the gouge, put a small amount of Solvol on the MDF slip face, and use it just like a regular slip stone, but only on the â€˜pushâ€™ stroke (see gallery image 26). Polish the inner face as before, but watch that inside bevel! 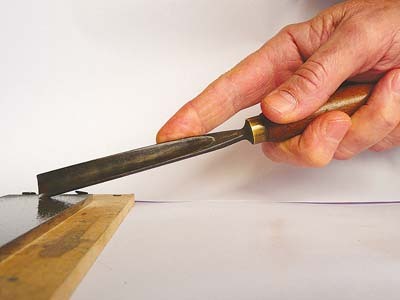 Gouges need to be stropped every few minutes during carving and it is a good habit to always strop before you start carving. Stropping the edge on a piece of leather dressed with fine abrasive helps keep the tool sharp by removing tiny amounts of metal from the face of the bevel. 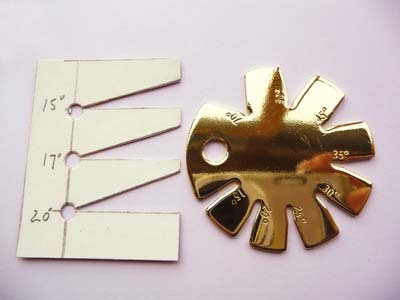 Strops are usually made from thin leather and have a fine abrasive dressing to help keep edge tools polished and sharp. I dress my strop with Solvol or green buffing soap. 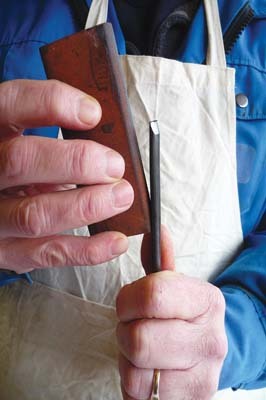 The hand holding the tool handle must maintain the angle that ensured the bevel was flat during honing, but now the tool is drawn backwards along the strop with steady pressure, rolling the tool from side to side, to ensure that all the bevel surface is stropped. If held too high, the edge will be slightly rounded over. 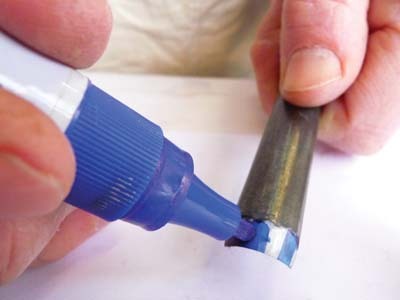 Ink up the bevel and after a few strokes on the strop, check your progress - the ink should be removed evenly from the bevel. 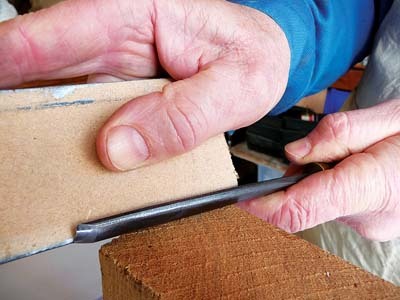 A carver I know uses 800 grit wet or dry paper stuck on a piece of MDF as a strop, and it is very effective, as long as the bevel is kept flat. A sharp tool with a mirror finish on the bevel is the result of regular stropping. It is as important that the inside face is as highly polished as the outer bevel. Classic Hand Tools for a wide range of good products.